In most judicial systems, premeditated crimes are considered the worst. Whether they are murders, assaults or other violent crimes, they are frowned upon and dealt with harshly, because they are the result of an idea that has been planned and acted upon. But what about premeditated goodness? What about those times when we have an idea that will benefit others, develop a strategy and take action to make the lives of others better? Random acts of goodness are nice. 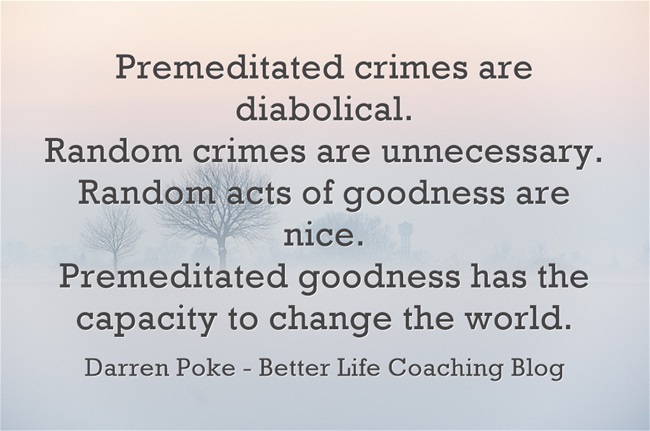 Premeditated goodness has the capacity to change the world. What are you planning to do today that will make the life of someone else better? Next post – Are You Running or Dawdling?